Keep calm and code on. It’s bottling day! After almost two weeks of sitting and watching my West Coast Pale Ale bubble and bubble (and bubble), bottling day has finally arrived. I’m hoping that everything went alright with the fermenting process, being as this is my first batch I have no reference as to if I did everything right or not. At the very least, the bit that I tried today tasted like flat, warm beer. (Flat, warm, good beer, actually.) 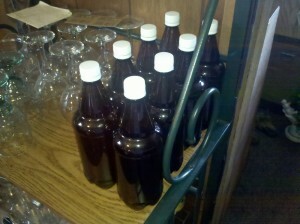 So, now it’s all bottled up and hopefully working away at carbonating. For my next trick, or at least my next beer, I’ve decided on a Blueberry Bock. In fact, I just ordered the fixings.